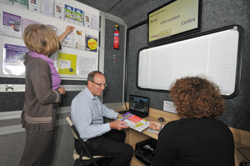 The Rural Information Centre (RIC) is a unique outreach resource available to hire by local, not-for-profit organisations. The vehicle is owned, managed and driven by snvb. Brand the vehicle to suit your message and promote your services. You decide where/when you want to go (subject to our bookings diary) and to which destination(s), best to connect with your target customer base and clients. Attract new customers and interest; promote new services. Take advantage of this ready-made, unique resource. Our full-day package includes the driver, diesel, electrics, insurance, laptop, leaflet racks, internet access (subject to connectivity), staff support, tables/chairs and wi-fi printer. 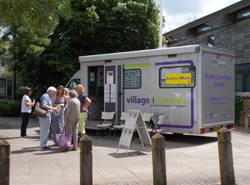 Use as an all-weather, mobile base for your staff team; for consultations, questionnaires and surveys; as a hub for leafleting, etc. Use the office on board the vehicle for one-to-one, confidential meetings, client appraisals, health checks, etc. Over the last few years, many organisations have gained benefit from hiring the RIC for effective and innovative community engagement. 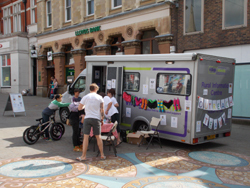 They include Autism Concern, British Red Cross, Community Law Service, Credit Union, Daventry District Council, Epilepsy Action, Healthwatch, Nene Clinical Commissioning Group, NHS Sexual Health team; Northamptonshire ACRE, Northamptonshire Carers, Oxfordshire Community Bank and South Northants Council. Together we have visited a wide-range of destinations across the county and beyond into neighbouring counties. Typical destinations include supermarkets, community centres, country parks and playing fields, leisure centres, schools/colleges, GP surgeries and hospitals. The RIC is currently deployed two days a week with the NESS project.